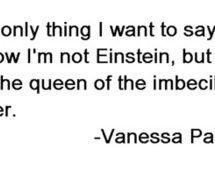 See the gallery for quotes by Vanessa Paradis. You can to use those 7 images of quotes as a desktop wallpapers. I'm super lucky because I come home and I don't have to run errands and clean the house and do all that. It's not my style to judge anybody. The songs from your childhood, when you hear them you get chills all over. Much more quotes by Vanessa Paradis below the page. Women are the real superheroes because they're not just working. They have a life and everything. As long as you're fully present in what you're doing at the moment, you're doing it. I don't have famous neighbours and if I did, I'd avoid them. I don't live the jet-set. I understand those who don't like me.